Open over 21 years. Great Service. Go out of the airport down the slip road heading for Valencia/Murcia AP7. Take the first right (400m) turning signposted Alicante N340. Go down the slip road. Take the first turning on the roundabout - towards Alicante South N340. Continue on this road for approximately 2.5km until you see the GPV building on you right (you will also see 2 large blue buildings on your left we are the top one). Take the second left just after the GPV and we are at the top of that road. Exit the N332 onto the N338 heading towards the airport. Go passed the airport. Take the first right (400m) turning afer the airport signposted Alicante N340. Go down the slip road. Take the first turning on the roundabout - towards Alicante South N340. Continue on this road for approximately 2.5km until you see the GPV building on you right (you will also see 2 large blue buildings on your left we are the top one). Take the second left just after the GPV and we are at the top of that road. Exit the N332 onto the N340 signposted Torrellano, Elche Murcia. Continue for 1.5km until you see the circular CAM bank building on your right. Just after the CAM take the next right and we are at the top of the road (A large blue building). Exit the A-7 following the signs to the airport, take the next right signed N340 Torrellano/Murcia. Follow the slip road to the roundabout. Go all the way round the roundabout, so you are heading back on yourself (signed N340 Alicante). Go straight over the roundabout and under the bridge then go staight over the next roundabout. Continue on this road for approximately 2.5km until you see the GPV building on you right (you will also see 2 large blue buildings on your left we are the top one). Take the second left just after the GPV and we are at the top of that road. We have been established over 21 years and have much lower rates than on-site Alicante airport parking. We also have lower rates than the other off site parking companies and in case you find one cheaper we offer a price match guarantee up to 6 months parking. If you are looking for cheap, reliable and safe Alicante airport parking we are sure you won’t find a better deal anywhere else. Our outdoor car park is 24,000 m2 and is manned 24 hours a day. It has 24/7 video surveillance and is secure and fully insured. 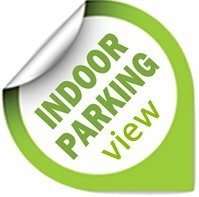 We have 2 fully enclosed indoor carpark. Both are alarmed and insured.